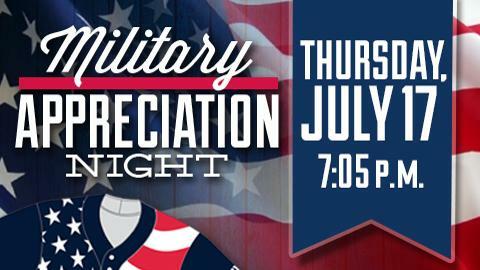 ROUND ROCK, Texas - On Thursday, July 17, the Round Rock Express will honor and support the brave men and women that serve or have previously served in the United States Armed Forces by hosting Military Appreciation Night at Dell Diamond, presented by Budweiser and USAA. Two generations of heroes will be involved in the night's ceremonial first pitch. A veteran of World War 2, the Korean War and the Vietnam War, Rufus Dye Jr. will be joined by his son Colonel Michael Dye. Michael currently serves in the Texas Army National Guard as the Director of Army Aviation for Joint Forces Headquarters. During the game, each branch of the military - Army, Navy, Marines, Air Force and Coast Guard - will be recognized individually along with a Marine Corps swearing-in ceremony. Silver Star recipient SSG Matthew Kinney, Gold Star Mother Tami Sims and SGT Travis King, who is scheduled to deploy in the coming weeks, will be among those honored during the game. Express players and coaches will wear commemorative patriotic jerseys that will be auctioned off during the game with proceeds going to WISH for OUR HEROES. Additionally, there will be a wish granted during the game in conjunction with the Wish for Our Heroes initiative. For the seventh-inning stretch, country music artist and songwriter Ryland Edwards will be on hand to sing "God Bless America".